We are extremely saddened to have to say good-bye to Bob Bisbee Sr. He is a loved husband, father, mentor and friend to so many people around the world. Bob peacefully passed away Thursday evening, June 14th in the north Dallas metroplex. He will truly be missed by his loving family and so many great friends. He is survived by his wife Aina, children Debbie, Bob Jr., Wayne, Tricia, Erik and Destiney, many grandchildren and even great grandchildren. He also leaves his sister June and brothers Larry, Gary, George and Bruce. Bob was born on March 6, 1933 in Excelsior Springs, Missouri. He moved to California in 1958 where he met and married his wife of 58 years, Aina, in 1960. Orange County was his home for the following decades where much of this time he could always be found at his fuel dock and tackle store on Balboa Island in Newport Harbor. In the mid-60s, this SoCal fishing and boating connection led him to many personal and business ventures in Cabo San Lucas, Mexico, which became his favorite place on earth. It is also where he created and maintained the majority of his life-long and numerous friendships. 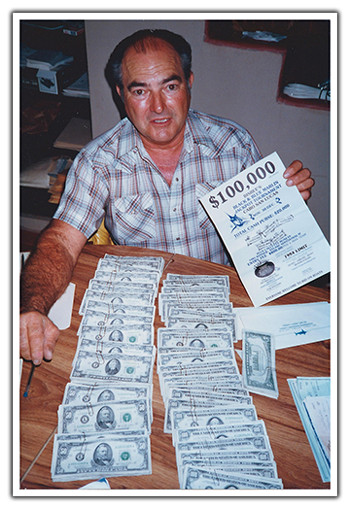 Bob is best known and respected for founding the Bisbee’s Black & Blue Marlin Tournament in Cabo San Lucas, now in its 38th year. He and Aina have been residing in Lucas, Texas, since 2006. Our family graciously thanks everyone for your kind thoughts and prayers that have already begun pouring in. His wishes are simple, but he did want everyone to know that he couldn’t have asked for more in life than his family, friends and accomplishments. We will be having a private family gathering in Texas on Saturday, June 23rd. However, since so many of those who know him are literally spread throughout the world, we feel that the most appropriate way for everyone who would like to say good-bye would be at a celebration of life in Cabo in October. This is where so many of us all gather each year anyway, and we’ll be able to offer him a toast together and spread his ashes then, in the waters he loved so dearly. As details are finalized we will post them on our website at Bisbees.com/FarewellBob, where comments and pictures can be posted. All will be very much appreciated.